CorMat uses a novel, contra-rotating rotor system to cost-effectively harness tidal energy. Training instiution announces opening of a new operating base at the prestigious Wynyard Business Park, Teesside, in the heart of North East England. Britain-based trade association representing the wind and marine power sectors will now include companies involved in tidal lagoon energy. Dutch company Airborne International wants to be a leading player in the supply of composite blades for tidal turbines. We found out more from Peter Coppens, Business Development/ Commercial Manager at Airborne Marine. Renewable energy company to develop one of the UK’s first ‘next generation’ tidal energy schemes in waters off the Mull of Kintyre. Marine Scotland has given consent for the deployment of the first Contra Rotating Marine Turbine device, or CoRMaT, to be deployed in the Irish Sea, south of Machrihanish, Argyll. According to Nautricity, the device is capable of generating enough electricity to supply 400 homes. 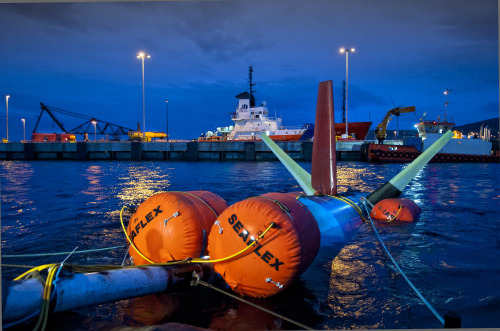 The Glasgow-based company is only the fourth to be granted full permission to deploy tidal devices in Scottish waters, having already received consent from the Crown Estate and SSE, the electrical network operator. In addition, Argyll and Bute Council has approved the construction of an onshore sub-station that will connect the array to the national drid. Work on the onshore connection is expected to start later this year with the devices being deployed in the water in early 2015. Nautricity was selected to develop the CoRMaT technology as part of the Government’s WATERS2 funding package, aimed at helping Scottish firms to secure an increased share of the international marine energy market. The company recently announced it was on track to be the first tidal energy technology developer to produce commercially viable electricity after starting tests on the device. “This will inform the most cost-effective development route to be adopted for all technical and commercial aspects of the project," said Cameron Johnstone, Nautricity co-founder and CEO. Johnstone believes a multi-megawatt array could be realised on the site post-2016. The waters off the Mull of Kintyre are one of only four locations in Scotland to receive full consent for commercial operation. The turbines will be completely submerged and not visible from shore and they will have no measurable adverse impact on the marine environment. "Receiving full consent for this project is a great vote of confidence in our technology and our site development capabilities,” Johnstone said. In 2012, Nautricity commissioned a comprehensive environmental impact assessment and a community and stakeholder engagement exercise in the area to ensure the project commanded popular local support. 1. CoRMaT, with its rotor span of 10 metres, is significantly larger than early test models.The device uses a novel, contra-rotating rotor system to cost-effectively harness tidal energy. While conventional tidal devices resemble wind turbines constructed on the seabed, incurring enormous deployment and engineering costs, it is lighter and more compact, tethered to the seabed and held in tension by a sub-surface float. The turbines can be deployed in a range of water depths of up to several hundred meters deep and, because their closely spaced, contra-rotating rotors moving in opposite directions, they remain steady in the face of strong tidal flows, allowing the device to “fly” from a simple tensioned mooring. This allows the device to maintain optimum alignment into the tidal flow as it varies its direction for maximum energy capture.